Things Connected NI will harness the potential of the Internet of Things (IoT) to address long-standing issues in Northern Ireland such as managing tourism, enabling home-based healthcare, farm safety, and the Brexit border issue. One of three regional programmes across the UK and led by Ulster University, Things Connected NI is delivered by a consortium of partner organisations from a wide range of sectors who have come together to see how technology can solve some of the key challenges currently facing Northern Ireland. The programme will deliver a series of large-scale well-funded technical challenges for SMEs to accelerate IoT take-up by creating a platform to develop novel IoT technologies with commercialisation potential. The Things Connected Northern Ireland network offers a low power, wireless, wide-area network for development of Internet of Things devices. This network enables SMEs, makers and researchers to develop IoT solutions that need to communicate with services across large geographic areas while using the least amount of energy possible. “We are delighted to lead this innovative programme here in Northern Ireland. 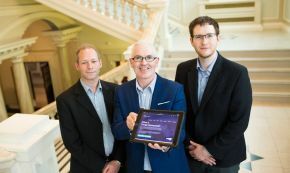 Ulster University is at the forefront of the Internet of Things revolution. This is supported by our world-leading research in connected health and data analytics, as well as our innovative teaching practices including the development of a new IoT Masters programme which responds to the emerging importance of careers in the field and its relevance to so many vital sectors. “With the help of our partners we have rolled out this free-to-use regional LPWAN network which covers the whole of Northern Ireland. LPWAN technology can be used in remote healthcare and wellness monitoring, boosting manufacturing efficiency, creating intelligent transport and agriculture solutions, and enabling better management of resources. Things Connected is a UK wide initiative by Digital Catapult to support UK businesses using LPWAN technologies. Following a competitive open-call, the Northern Ireland Consortium, led by Ulster University, were selected to roll out a coast-to-coast network in Northern Ireland. The Northern Ireland Consortium is led by Dr Philip Catherwood (School of Engineering) and Dr Joseph Rafferty (School of Computing) from Ulster University and is composed of all the Councils in Northern Ireland, Invest NI, TourismNI, the regional IoT forums, the infrastructure installer Bluebox Broadband, as well as a large number of NI's leading private industry technology experts & business leaders.